ArchView- View archive files online! Everyday we download lots of files such as zipped documents, graphic icons pack, software pack, blogger themes pack, plug-ins and even music pack, movies parts inside all the zipped files which are all piled up into one big size file and you can’t see them until they are downloaded to your PC. This problem may now be solved by using this Firefox plug-in. You can now check whether there is anything there at all to download the only file you need. ArchView can open archive file online without downloading the whole archive. Just like normal web pages. It is very fast since it merely fetches a small portion of the archive file from server. 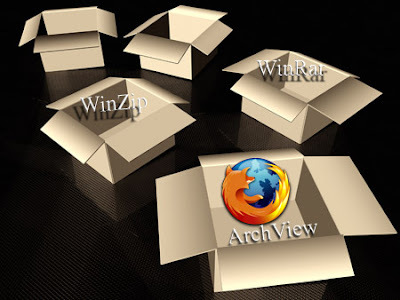 ArchView supports RAR (WinRaR), ZIP formats and ISO CD image; HTTP, FTP and file: protocols. And it can present XUL or HTML interface. One great advantage feature of this add-on is that you can choose to download any specific file instead of the whole bulky achieve file. Thnkx for this info, i wonder if any chance to do so with torrent file. Thank you for providing this very informative information. I am bookmarking this site and putting a link on my website.